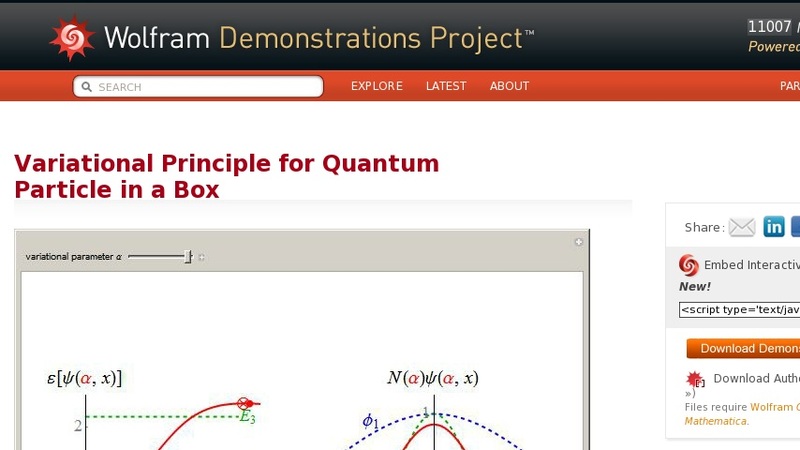 This Demonstration shows the variational principle applied to the quantum particle-in-a-box problem. The Hamiltonian describing the particle is ... , and the eigenfunctions and eigenvalues are given by ... and ... , respectively. If ... is a trial wavefunction that depends on the variational parameter ... , then minimizing the energy functional ... with respect to ... leads to an estimate for the energy. In this example, the values of ... that minimize ... are ... and ... , ... . The left panel shows the energy estimate and the three lowest eigenenergies, where the red ... are located at the ... , and the right graphic shows the normalized trial wavefunction for the ground and second excited states, which are the lowest even functions with respect to the central point.